NEW YORK (AP)—Bob Sheppard has no intentions of returning to his longtime job as the public address announcer at Yankee Stadium, MLB.com reported on Nov. 26. Sheppard, who is 99, hasn’t worked a game since late in the 2007 season due to illness. When contacted by The Associated Press, Yankees spokesman Jason Zillo said the team had no announcement or comment at this time. Sheppard has called out names from Joe DiMaggio to Mickey Mantle to Derek Jeter over the years. 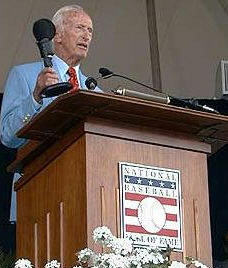 For the final game at the old park in 2008, he recorded a greeting to fans and the introduction of New York’s starting lineup. Paul Olden took over as the public address announcer at the new Yankee Stadium this year in Sheppard’s absence. Jim Hall, a longtime backup, filled in for Sheppard late in 2007 and last year. Sheppard told MLB.com that he doubts “very, very much” that he’ll be able to resume his duties for even one game next season.